Yes, accidently. And with the help of enormously friendly, intelligent spirits, Lyle and Betty, I was brought back many times during a two-week period. During my visits, I was taught a wide range of fascinating lessons that still give me goosebumps when I recall them. Suffice it to say, visiting the afterlife dimension shook my belief system to the core and forced me to view the miracle of life in a whole new way. 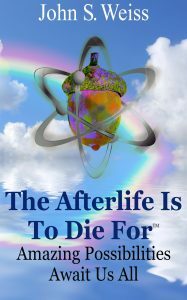 The afterlife – which is neither heaven nor hell – is filled with just about all the answers to life’s most perplexing questions, as well as questions no one could ever think to ask. There’s a revolutionary biological science that makes the afterlife a “normal” reality. The origins of Christianity are not what you suspect. Quantum science is the root of everything. The brain severely limits many of our abilities, but brain dysfunction enables them. Savants are responsible for most things that make us civilized. Memories are the most important things we own and can create 100% lifelike experiences. During my time in the afterlife, I was extremely skeptical about everything. I mean, who in their right mind would believe any of it? Well, two things made me a believer. First of all, Lyle and Betty taught me things that I was able to verify by research. And, most mind-boggling of all, Lyle returned to this dimension with me and showed me something that was all too convincing! Now, with the knowledge of what’s to come after I pass away, I’m going to live my life to the fullest and keep an open mind to absolutely everything. I miss Lyle and Betty and look forward to eventually seeing how their relationship transpired. Actually, my book deals with their paranormal romance, and that’s about as strange as anything I encountered. Before all this happened to me, the word “impossible” was part of my everyday vocabulary. But no more! After what I’ve seen, heard and experienced, that word will rarely pass my lips. If you read my book with an incredibly open mind, it’s quite possible you will agree. Read the Introduction to my book.